It’s 10 years since I lived in Beirut as a journalist, reporting on the war between the Shiite militant group Hezbollah and Israel in the summer of 2006. I had been back a couple of times but never for very long, and this spring, when I found myself there for almost a month, I took long walks to reorient myself. The Levantine spring was just as Mediterranean blue and gardenia-scented as I remembered it. The garbage crisis of the winter, when a political dispute over the collection contract resulted in rotting odors wafting over the whole city, had been mercifully resolved. Much felt familiar to me, but much had changed. Beirut is a city that never stops building over itself; empty lots had sprouted whole new neighborhoods, and shiny towers of serried glass balconies rose on the hillsides. New tribes of hipsters and Syrian refugees had settled in the crannies between run-down neighborhoods and old, abandoned factories. First, I revisited the places I knew and loved. I sat in the sunshine beside the seaside at Al Rawda Café, where I had once swum off a bullet-pocked concrete jetty on the first surreal afternoon of Israeli bombardment. I dragged french fries through my favorite garlic cream dip and drank mint lemonade. I joined the elegant suede-loafer crowd at Casablanca, which had once been the first modern place to eat in the city (tuna tartare!). I sat among the air-kissing elites, in the elegant triple-arch-windowed dining room overlooking the Corniche for a cosmopolitan brunch: bagels and fig jam, labneh with zaatar and olives, eggs Benedict. At the bar Torino in Gemmayze, an area of old Levantine houses in the Christian east side of the city, I found Michael, the bartender, still doling out memories and advice in his Staten Island accent. Torino was the only place that stayed open in the first days of the war, and I remember taking refuge from the bombing there, grateful for the whiskey and the company. It seemed at first as if a decade had not passed at all, but then I would notice that many places I had often gone to were shuttered, or that a whole street had been erased by a new skyscraper. I passed by Le Chef, my old standby, a Franco-Lebanese hole-in-the-wall restaurant. “Wendy!” boomed the maître d’, Charbel Bassil, standing in the doorway. Like much of Beirut, Le Chef had been spruced up during the 10 years I had been away, but the homey, welcoming atmosphere was the same. A plate of pickles and radishes appeared automatically, just as always, and I slurped my fatteh , a comforting mulch of toasted pita bread drowned in yogurt and tahini with cumin. Walking in Beirut is to perform parkour-hopscotch through a patchwork of sectarian neighborhoods accompanied by the clanging of construction. I climbed over walls, retraced my steps out of cul-de-sacs and scaled staircases up cliffs. Downtown was rebuilt after the civil war, which lasted from 1975 to 1990, but after the assassination of the Sunni Prime Minister Rafic Hariri in 2005, the hoped-for shoppers and investors from the wealthy Gulf countries never came. Now, in reaction to ongoing demonstrations against the government during the garbage crisis, it has been barricaded, and its streets are deserted. There are not many tourists anywhere in the city. Westerners are still leery of a country in which bombs occasionally go off, and Syrian refugees now constitute probably over a quarter of the population. There are frequent power cuts and water shortages, and the government dysfunction is characterized by the political stalemate that has left the post of president vacant for two years. How the state continues to function is just another one of the many mysteries of Lebanon. Despite the roiling politics—or maybe because of them—Beirutis have always loved eating and drinking. East of Gemmayze, I found a new enclave of cocktail bars and craft beer dives and terraced restaurants in the area of Mar Mikhaël. I enjoyed a perfect, bitterish macchiato and a sliver of chocolate sable biscuit in Papercup, an architecture and design bookstore with a coffee machine in one corner. I sipped arak on the grand terrace of Enab and nibbled multicolored meze , brick-red muhammara made with walnuts and red peppers, and springy, zingy green tabbouleh . I hung out at Junkyard, a sprawling bar and restaurant emporium, with its rambling Brooklyn industrial graffiti vibe under the canopy of a rebar tree sculpture hung with lanterns made from perforated washing machine drums and plastic water-cooler bottles. I thought about ordering a “French time” cocktail made with muddled thyme, gin, pink grapefruit, lemon juice, olive oil and an absinthe spray, but I chickened out because of the absinthe. 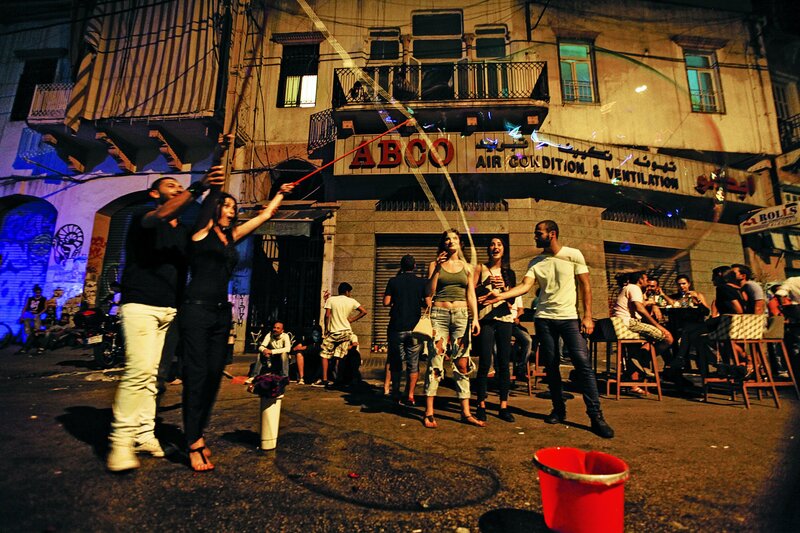 Mar Mikhaël is where the glamorous, monied denizens of Beirut mingle—rich Syrians taking respite from Damascus, ironically hipster-bearded Shiite Muslims having a beer away from their Hezbollah-controlled suburbs, Francophone Maronite ladies as chic and high-heeled as Paris Fashion Week models. Sitting outside, laughing, drinking under overhanging bougainvillea, they are all indistinguishably cool. Beirut was always where East met West and kissed it three times to say hello. “The Lebanese are very open to new kinds of food,” Dima Chaar, a chef originally from Damascus, told me, laughing as she served up a “Syrian taco” made with Aleppo crispy chicken and mayo at a global street food event at Junkyard one evening. But increasingly, the restaurant scene has experienced a return to the traditions of slow-cooked comfort food. At Tawlet in Mar Mikhaël, lunch is different every day because women from different parts of Lebanon come in to cook their regional specialties. The farmer's market in the downtown souk is a popular hangout on a Saturday morning; you can breakfast on freshly griddled manoush flatbread and buy jars of mouneh— pickles and preserves made from everything from aubergines stuffed with walnuts to rose petal jam. In Gemmayze, a restaurant named Kahwet Leila serves up “traditional with a twist”—Lebanese fare in what it calls “authentic kitsch” surroundings decorated with posters from Beirut's jet-set ’60s heyday. On my last evening in Beirut, I met a friend at midnight for a late drink at Al Falamanki on Monot Street, which is a restaurant located in the sprawling interior of a traditional Lebanese house. In one corner, there were clusters of 1970s serge sofas; in another, backgammon games clattered in a parlor; on the terrace, tables were covered with mismatched oilcloths, as if you were sitting in the kitchen of your favorite Lebanese aunt. We smoked apple shisha , and the smoke drifted over our conversation. Maybe it doesn’t matter what decade it is. Beirut has always married the bittersweet of nostalgia with the have-fun of the present; in such an unstable region, nobody knows what tomorrow will bring.